Released on Nintendo Switch on July 28, the mostly harmless Infinite Minigolf was pulled from the console’s online shop on August 10 due to an unexpected change to its ESRB rating. Zen Studios says the change was due to a poster on the wall in the game’s “Giant House” level. I’m pretty sure we’ve figured out which one. When I noticed a Reddit thread discussing the game being pulled due to the ESRB reconsidering its E for Everyone rating, I was surprised. 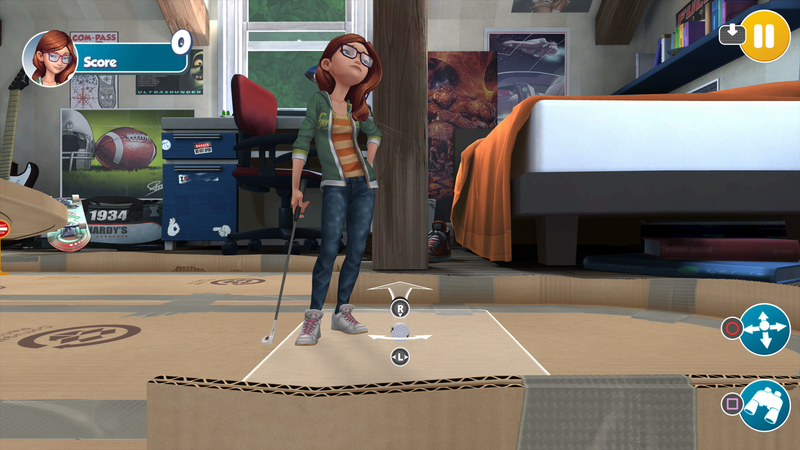 I’ve been playing Infinite Minigolf on the PlayStation 4 for a couple of weeks and hadn’t noticed anything offensive. It’s a cute little golf game with creative courses and a ton of family-friendly user generated content. But the PlayStation 4 and Xbox One versions are rated T for Teen, with a warning of suggestive themes. I loaded up my PS4 copy using PlayStation VR and looked around. Race cars, sports teams, spaceships ... ah, there it was, tucked between the desk and the bed. If you look closely (click to enlarge) the image above, you’ll see a poster of a large, bloated demon with that seems to be several naked or barely-clad women cavorting about its groin. I never even noticed it. Though Zen Studios has not confirmed the demon poster is the one that caused the ESRB rating issue, I didn’t spy any other posters that could be considered inappropriate. Just the hand stickers on the desk drawer, and I’m probably just reading into those. Zen says (via Twitter) that they’ve removed the offending content from the Switch version, resubmitted the game and is hopeful the Switch version of Infinite Minigolf will be back to E for Everyone and in the Switch eShop soon. [Update—8/29, 7:00 am]: Responding to Kotaku’s email inquiries, Zen Studios vice president of publishing Mel Kirk commented on game’s removal from the North American Switch eShop. “Yes, the game was pulled from the eShop in North America due to the inclusion of some artwork that was placeholder, but somehow ended up in the game. Nintendo of America has a policy that if your ratings jump in drastic way they will remove the game from the store. This is totally our fault, the art should not have been in the game. We have submitted a patch that is currently in approval, which removes the art and will revert our rating back to E.
[Update—9/19, 3:30 pm]: After a long wait, Infinite Golf is now available once more on the Nintendo Switch, the demon poster replaced with some generic, non-offensive art.